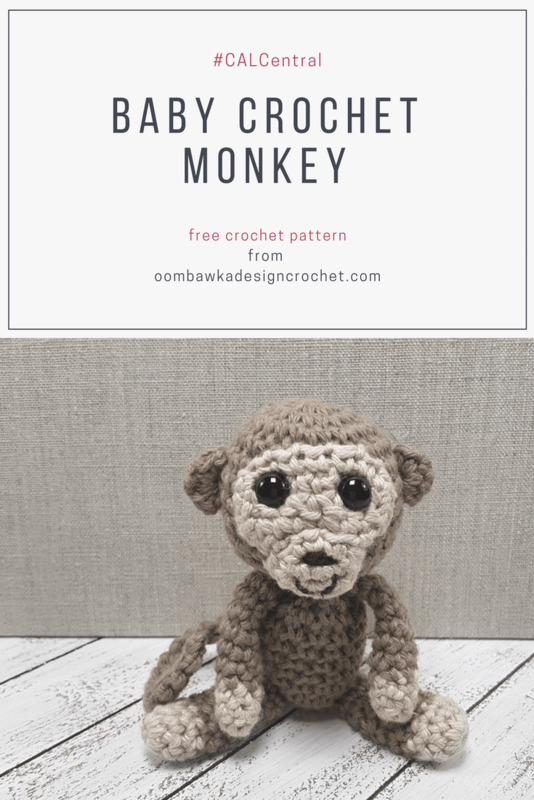 You are here: Home / Free Crochet Patterns / My Free Patterns / Free Crochet Patterns for Toys and Amigurumi / Have you seen my Baby Crochet Monkey? 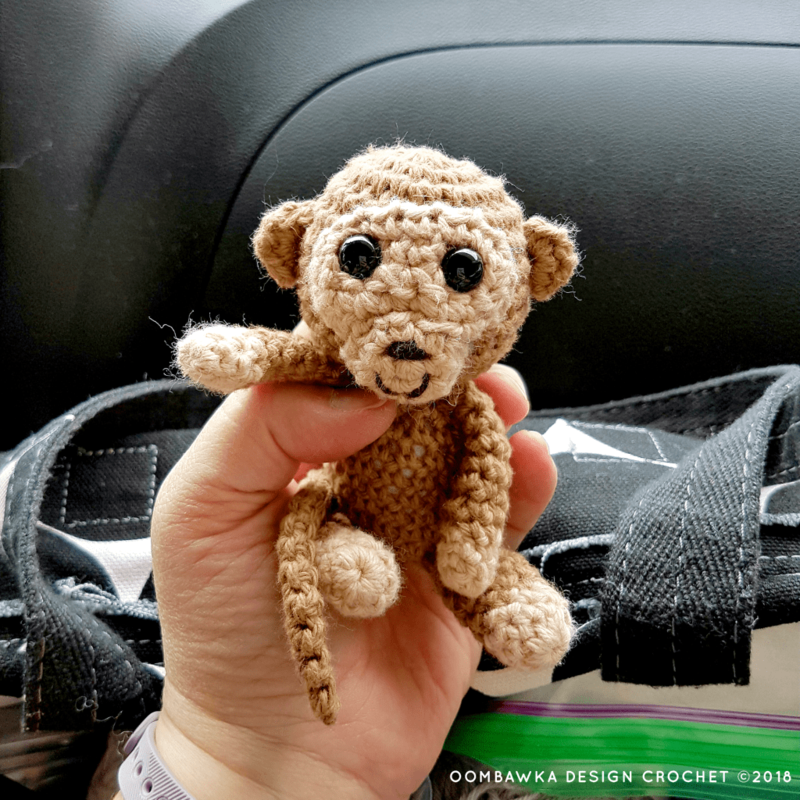 Have you seen my Baby Crochet Monkey? This pint-sized little monkey can easily fit in your hand. He is much loved by little ones and enjoys monkeying around! Crochet one today with my free pattern! I received the Original Poly-fil Premium Polyester Fiber Fill I used to stuff my monkeys from Fairfield World. This post includes affiliate links. If you purchase an item after you click on one of my affiliate links in the post, I will receive a small commission for referring you, at no additional cost to you. 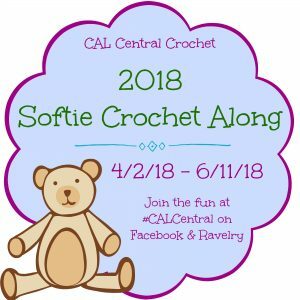 Welcome to Pattern 2 for the 2018 Softie Crochet Along! 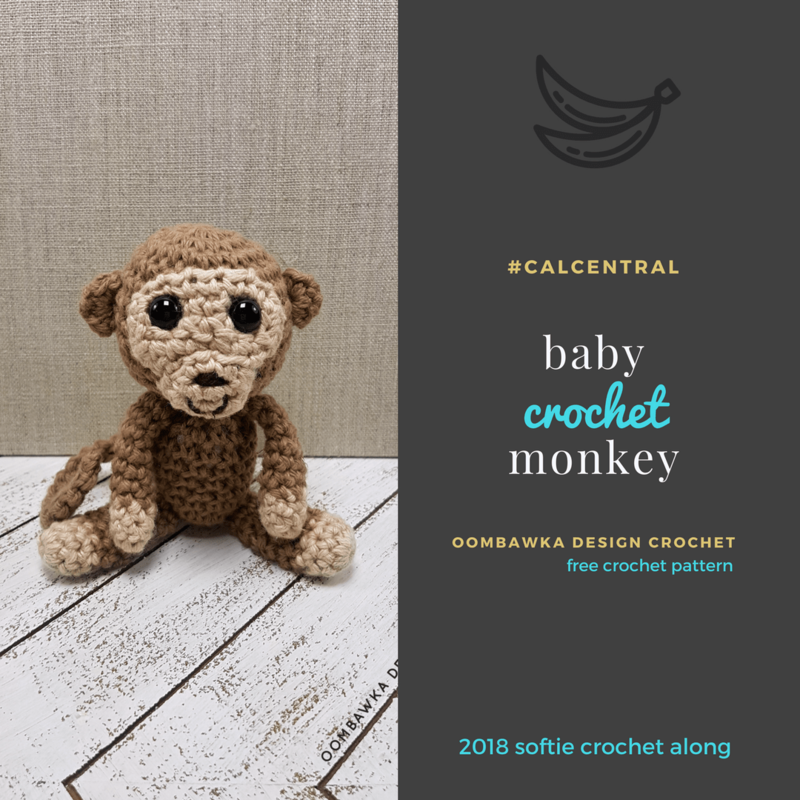 This sweet baby crochet monkey is an easy-to-crochet project you can make in just a few hours. He is crocheted in DK weight  yarn and using a 3.75 mm (F) hook. I used Poly-fil Premium Polyester Fiber Fill which was given to me by Fairfield World to stuff my little baby crochet monkey. He is soft, huggable and pint-sized for small hands. If you want to give this a try using medium weight yarn, please use a hook size 4 mm (G) and larger black safety eyes. Color 1: Linen, Color 2: Cashew. I used CotLin in Coffee for the nose and mouth. If you are giving this crochet monkey to a baby, or small child please consider using embroidered eyes instead of safety eyes. This head, body, arms, legs and ears are worked in rounds. The face patches and tail are worked in rows. The monkey is assembled by sewing the pieces together with yarn. The project is worked in continuous rounds. You will need a stitch marker of some sort (paper clip, scrap of yarn, stitch marker) to mark your place. Do not join with a slip stitch at the end of the rounds or chain any additional stitches. These are unnecessary and will only add extra bulk to your project. When I put the head together, I temporarily stuff it to make it the ‘right shape’ before placing the face patches in place. Then I insert the safety eyes through both layers (the face patch and the head) to choose their position. When I am happy with how they look, I remove some of the stuffing in order to get my fingers inside to securely close the backs on the eyes. Then I re-stuff the head firmly and continue to crochet the head. The eyes will temporarily hold the large Face Patch in place until you are finished the head. Your stitches need to be fairly tight so if you have big spaces when you are working please go down a hook size. The body, head, and small Face Patch are stuffed with Original Poly-fil Premium Polyester Fiber Fill. You may also add Poly-fil to the hands and feet. I did not stuff the remainder of the legs and arms – only the hands and feet. This makes them very easy to move and play with. The face patches are worked back and forth in rows. We finish them with a simple edging of single crochet. Row 3: Rep R2 but do not turn. Work a simple edging around the outside of the face patch in single crochet. I worked 17 sc around and then finished off with an invisible join. As long as your stitches are evenly spaced you can have as many sts as you need. I only worked 1 in each corner to create the rounded shape. Finish off with an invisible join, leaving a long tail of yarn for assembly. Work a simple edging around the outside of the face patch in single crochet. I worked 10 sc around and then finished off with an invisible join. As long as your stitches are evenly spaced you can have as many sts as you need. I only worked 1 in each corner to create the rounded shape. Finish off with an invisible join, leaving a long tail of yarn for assembly. Finish off with a long tail of yarn (about 8 inches). Fold the ear in half and whip-stitch around the outer edges to form a half-moon shape. Do not finish off as you still need to attach the ears to the head. The arms are worked in rounds, beginning at the hands. When I changed colors, I finished off color 1 with an invisible join before adding color 2 with a standing single crochet stitch. This gives it a invisible color change. R3: Rep R2. Finish off with an invisible join and stuff the ‘hand’ part you just made with some of the left over yarn ends (do not over-stuff) and trim the remaining yarn ends. R6-R11: Rep R5. Finish off leaving a long tail for assembly. The legs are worked in rounds, beginning at the feet. When I changed colors, I finished off color 1 with an invisible join before adding color 2 with a standing single crochet stitch. This gives it a invisible color change. R3: Rep R2. Finish off with an invisible join and stuff the ‘foot’ part you just made with some of the left over yarn ends (do not over-stuff) and trim the remaining yarn ends. Finish off leaving a long tail for assembly. The tail is worked in rows before being folded in half lengthwise and seamed. Finish off leaving a long tail of yarn. You will now fold the tail in half lengthwise and whip stitch the top and bottom edges together. Line up the stitches for the edge of R1 and the edge of R2 and using your long tail of yarn, whipstitch them together, from end to end. This makes the long skinny tail. Finish off and weave in the end. Do not weave in the initial 6 inch tail of yarn (see beg of R1) as you still need to sew the tail to the monkey. The body is worked in rounds beginning at the bottom of the monkey and working toward the neck. We do not close the top of the ‘body’ but instead we leave it open and whipstitch it to the head to create the neck. Stuff the body firmly (but do not over-stuff) with Poly-fil. Finish off leaving a long tail of yarn for assembly. The head is worked in rounds beginning at the top of the head and working toward the neck. We do not close the ‘head’ but instead we leave it open and whipstitch it to the body to create the neck. Stuff the body firmly (but do not over-stuff) with Poly-fil. Take your large Face Patch and position it where you think you would like it on the monkey’s face. Once you have decided, take your safety eyes and insert them through the face patch and the monkey’s head where you think you would like them. Do not put the backs on yet! If you like their position, great! if not move them until you have found the spot you like best. Now carefully remove some of the Poly-fil and firmly affix the backs to the safety eyes. This will hold the large Face Patch in place until you complete the head. Re-stuff the head with the Poly-fil you removed and continue to R12. Whip stitch over the final round of stitches on the large Face Patch using the yarn end in the same color. Finish off and weave in the remaining end. I sew some of it through the inside of the monkey. Place the small Face Patch on the monkey’s face and find a position you like before whip-stitching over half of the final round of stitches. Stuff some Poly-fil under the small Face Patch. Continue whip-stitching over the remaining half of the stitches. Finish off and weave in the remaining end. Using your small amount of brown yarn (or embroidery thread), hand sew a small nose and mouth on your monkey. You can use mine as an example or create a different nose and mouth. Now take your monkey’s ears sew them to the monkey’s head. I lined mine up to meet the top edge of the large Face Patch. Finish off and weave in ends. If you need to add a little bit more Poly-fil to the head or the body, now’s the time to do so. You can use the bottom end of your crochet hook or the eraser end of a pencil to push it into the body or head openings. Take your remaining yarn end for the body and line up the 8 remaining stitches for the head and the body. Whip stitch these remaining stitches together to form the neck and attach the head to the body of the monkey. Finish off and weave in ends. Add the arms, legs and tail to your monkey using whip stitches. Finish off and weave in ends. Your baby crochet monkey is now complete! 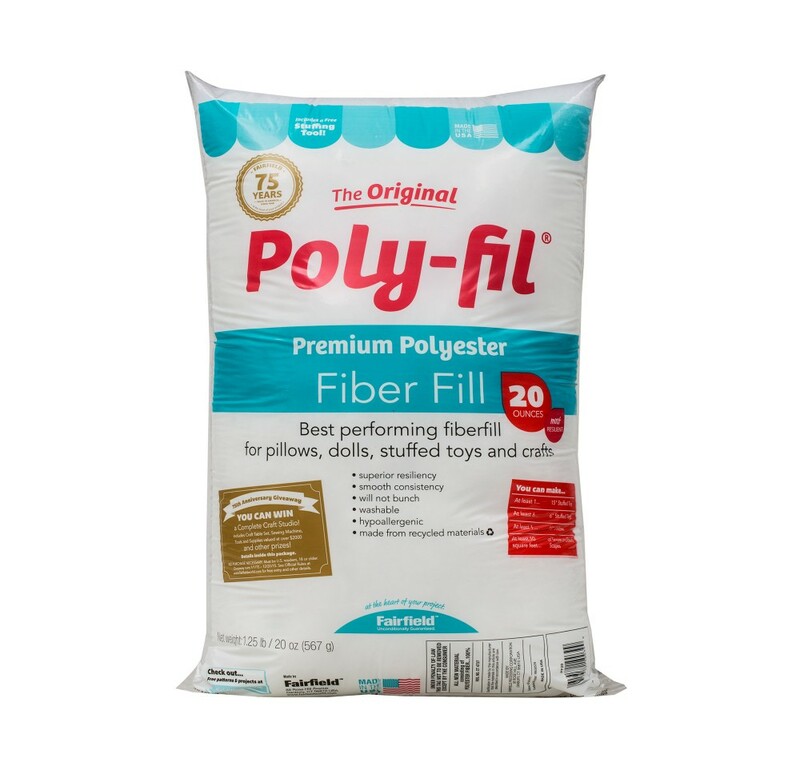 I’d like to thank Fairfield World for providing me with the Original Poly-fil Premium Polyester Fiber Fill I used to stuff my baby crochet monkey. For more information about Fairfield World and their fantastic selection of products, please visit their Website. Thanks so much. Don’t be shocked….making this up for my 55 year old daughter. She is a monkey-lover for sure….and of sound mind. Thank you so much for this pattern, Rhondda! I finished my little baby monkey: https://www.ravelry.com/projects/bekkfek/baby-monkey. The pattern is very well written and easy to follow. Thank you for making it available for free! Thank you so much for this pattern. I just love it so much I think I’m going to make a couple more to share with friends.